Summer is when your lawn grows, literally, overnight. If you had a few paddocks to keep shorter, and a horse or two lingering, this is what you would have used in the last century or the one before. 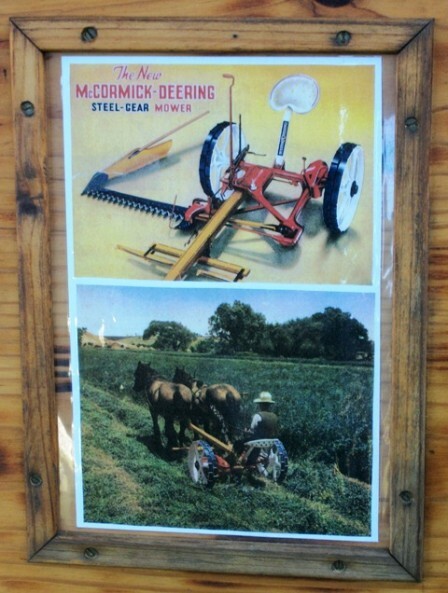 Horse-drawn Mowers as useful tools were first developed in the 1850’s. Prior to that scythes were used for harvesting or to keep the lawn at bay. The first blades were 4 to 5 feet wide and by the 1920’s versions up to 8 feet wide had been built. During the 1930’s petrol powered motors became more common. The one pictured here, from Trevor’s Museum, is a McCormick-Deering Horse Drawn Steel Gear Mower, is one of the earliest 4 feet versions and has been restored to working order. The mover converts the curvilinear motion of the ground wheels into the rectilinear motion of the knife. Transmission by gears alone is the most common method. The large gear is keyed to the main axle, and meshes with the small spur gear on the secondary shaft. The large bevelled gear on this shaft in turn meshes with the bevelled pinion on the counter shaft. The left wheel drives a gear box which powers the cutting. The left back pedal engages the drive shaft. The power is transmitted down the shaft to a flywheel. A piece of wood, which is no longer there, connected the flywheel to the mower blade. The right handle swings the mower vertical to allow for going to and from the field. The right back handle controls the angle of the mower to the ground. The hitch pole is setup for 2 horses that would be walking to the left of the rows now to be mowed. Cyrus Hall McCormick (1809-1884), inventor of this ‘mechanical reaper’ first demonstrated his mower at Steele's Tavern, Virginia in 1831. Although is credited with being the inventor, members of his family and others contributed to the design and mechanics. Sales of these began in 1842. In 1902 the merger of McCormick, Deering (tractor makers) and others created International Harvester which is still in business today. Domestic ‘push or reel mowers’ for suburban lawns were invented by Edwin Budding in 1827 in Thrupp, just outside Stroud, in Gloucestershire. Budding's mower was designed primarily to cut the lawn on sports grounds and extensive gardens, as a superior alternative to the scythe, and was granted a British patent on August 31, 1830. It took ten more years and further innovations to create a machine that could be worked by animals, and sixty years before a steam-powered lawn mower was built. 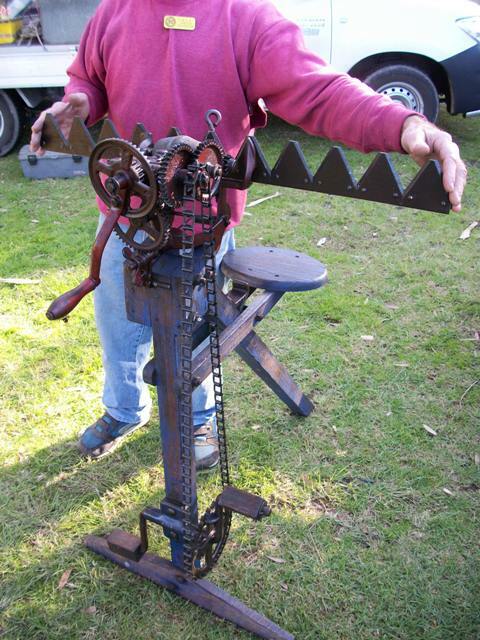 The first machine produced was 19in in width with a frame made of wrought iron. The mower was pushed from behind with the motive power coming from the rear land roller which drove gears to transfer the drive to the knives on the cutting cylinder; the ratio was 16:1. There was another roller placed in between the cutting cylinder and the land roller which was adjustable to alter the height of cut. On cutting, the grass clippings were hurled forward into a tray like box. It was soon realized, however, that an extra handle was needed in front of the machine which could be used to help pull it along. Two of the earliest Budding machines sold went to Regent's Park Zoological Gardens in London and the Oxford Colleges.] In an agreement between John Ferrabee and Edwin Budding dated May 18, 1830, Ferrabee paid the costs of development, obtained letters of patent and acquired rights to manufacture, sell and license other manufacturers in the production of lawn mowers.